Please deliver to.....: Eggs-cellent Easter? Is that a dino bunny? I love him. Oh. So that's how you make a dinosaur less scary? Good to know. Hey Laura. Here is proof that Extraordinary Superhero Penpals Minds Think Alike. Check out this link on my blog Last Year. How awesome is that? Cue music. Doo-doo-doo-doo-doo. Doo-doo-doo-doo-doo. So, I guess these dinorabbits (oooh, I like that, dinorabbits...) are carnivores? Because that one in your photo is eyeing those eggs mighty suspiciously...but seriously, who came up with this Easter holiday tradition thing, anyway? Because a BUNNY....hiding EGGS that have been painted...for children to find? There a lot of serious implications here. First, that bunny clearly didn't lay those eggs, so where did he get them? WHERE I ASK YOU! And how did the idea of painting the eggs bright pastel colors come into being? 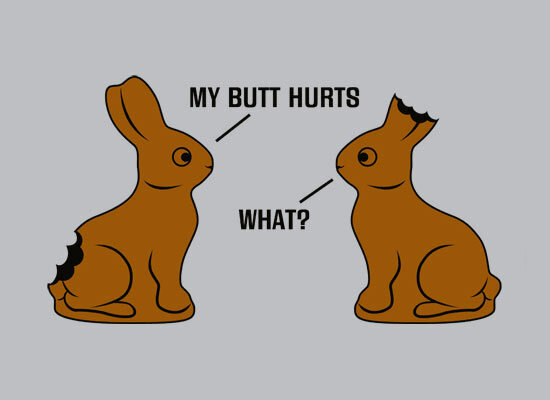 Sounds to me like this bunny was tripping on something not so good. And WHY and HOW did he get the word out to the kids to go on these egg hunts? It's a conspiracy, I'm telling you. That bunny's up to no good. What do you think, egg laundering? ....and is it really healthy to promote the ritual dismemberment of chocolate animals as a holiday tradition? I mean, I know that bunny did something not cool to get those eggs, but did he really have this coming? What do you think?